After months/years of hard work we can finally present to you: Databases of the older generations of My Little Pony! This year, during the celebration of the 35th Anniversary of My Little Pony, is the perfect moment for this update to the databases and hope you'll enjoy the new (err, old) friends from the MLP universe! You can now add all generations of ponies to your checklist, wishlist ánd: You now also have the ability to make add personal notes for every pony. Since our book will be released in about 2 weeks, and will focus on all generations as well, we made the decision to start fully developing the older generations databases so that all would be finished when the book will be released. We'd like to give a big thanks to the following people who massively helped with image donations for the databases: Ashlyne, Breyer600, StrawberryReef, Spoosh & Silver*dawn. Congratulations! it's a big step. It makes the page fresher to see such an improvement, more sections to explore, now we can track older generations of ponys yay! Just a little suggestion, would you check the "search by character" section? I'm afraid it's broken. About the section, when I click there it just don't load on my end, but I think it's my browser or maybe my old operative sistem and I didnt noticed it was as simple as it. I'll try a new version, or another browser to keep using this great site. Are There Codes to Identify Cutie Mark Crew Blind Packs? This work is licensed under a Creative Commons Attribution 4.0 International License . 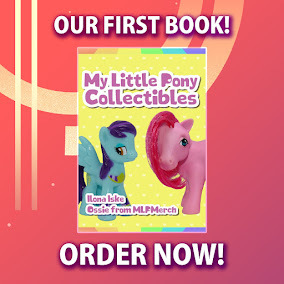 My Little Pony is © Hasbro. Images and articles © MLP Merch 2018 (unless stated otherwise).